A new velocity sensor remotely measures flow in open channels with non-contact Laser Doppler Velocity technology and non-contact Ultrasonic Level technology. The sensor uses advanced technology to measure velocity with a laser beam at single or multiple points below the surface of the wastewater stream. An ultrasonic level sensor is used to measure the level and then determines a sub-surface point to measure velocity. The sensor then focuses its laser beam at this point and measures the frequency shift of the returned light. This sensor is ideal for a broad range of wastewater monitoring applications and is compatible with readily available flow meters. With optional continuous wave Doppler Ultrasonic Area Velocity technology flow measurement continues without interruption even while submerged. With a specially designed mounting bracket the sensor can be deployed and removed from street level, avoiding the risk and expense of confined space entry. A variety of communication options enable programming and data retrieval from a remote location as well. Built-in diagnostic tools simplify installation, maintenance, and advanced communication options reduce site visits. 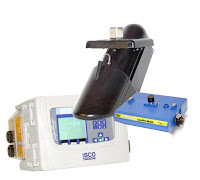 The sensor provides excellent system versatility across a wide variety of industrial applications to manhole installations, with many configuration options providing the flexibility to measure flow in most open channel applications. Depending on your application needs, the device can be programmed to take velocity measurements at single or multiple points below the water's surface, producing an accurate mean velocity reading. In applications where the level measurement point of the built-in ultrasonic and the measurement point of the laser velocity are of different elevations, such as a freefalling outfall or drop manhole, the remote ultrasonic option can be used so that both measurement points reference the same elevation. During submerged conditions, the optional bottom-mounted area velocity sensor seamlessly takes over the flow rate measurement. The sensor provides ultrasonic Doppler velocity measurement and Differential Pressure level measurement. This option measures flow in the pipe/channel. By measuring velocity over a large area, the ultrasonic Doppler technology provides more accurate flow measurement during submerged conditions. For redundant flow measurement at critical monitoring sites, a unique flexibility is added by an optional sensor which is mounted at the bottom of the pipe. This sensor provides redundant velocity, level, and flow data from the same site as the device. Following initial installation and adjustment, the sensor can be installed or removed as needed without manhole entry in most situations, using the optional sensor retrieval arm to grasp the handle. The handle's simple yet effective locking mechanism holds the sensor securely in place, and is easy to engage and release from above ground. Advanced Laser Doppler Technology for Non-Contacting Area Velocity Flow Measurement from Instrument Specialties, Inc.